While Rochester has been visited by several presidents, July 12 will be the 220th. anniversary of the arrival in the city (or rather what would become the city) of a man who would become a king, and the last king of France at that. There’s even a remote possibility that a few years later we were visited by another future king, and on a third occasion, by the man who would one day reign as the last emperor of France. The king-in-question was Louis-Philippe, Duke d‘Orleans, cousin to the Bourbon kings of France and thus a prince of the blood. When the French Revolution broke out he followed his father (who went so far as to change his name to “Philippe Égalité”) in supporting the revolutionary goals of a more democratic government under a constitutional monarch. However, as the revolution spun out-of-control into the Reign of Terror, Philippe Égalité, like hundreds of other nobles, was arrested and guillotined, and his younger sons, Louis Antoine Philippe, Duke d’Montpensier, and Louis Charles, Comte d’Beaujolais, were thrown into prison. Seeing the hand writing on the wall, Louis-Philippe, while serving as a general in the revolutionary army, wisely went over-the-hill and took refuge in Switzerland. Subsequent negotiations with the Directoire, the French revolutionary government, lead to an agreement under which d’Montpensier and d’Beaujolais would be released from prison if all three brothers accepted exile to the United States. 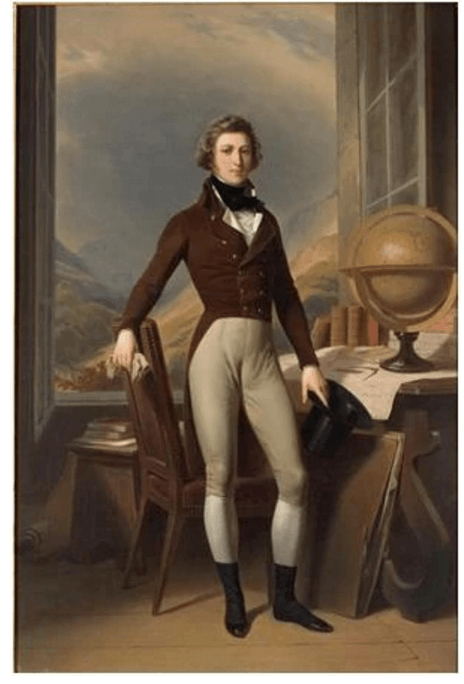 The 23 year old Louis-Philippe, accompanied by his manservant Baudoin, arrived in Philadelphia (at that time the national capitol) in Oct. 1796. True to their word, the Directoire released his brothers who joined him in February 1797, bringing with them a pet dog from their days in prison. As princes of America’s earliest ally, the three brothers were received by the out-going President Washington and attended the inauguration of the in-coming president, John Adams. As with many European visitors at the time, the brothers had a strong desire to see a New World under construction and decided to undertake a journey across the interior of America. Sadly, despite being the sons of one of the wealthiest men in France, the family’s estates had been confiscated upon their father’s execution and the brothers found themselves virtually penniless, having to borrow money to fund their travels. With letters of introduction from various prominent Americans in hand (in which they were identified in a less-than-incognito manner as, “Mr. Orleans”, “Mr. Montpensier”, and “Mr. Beaujolais”), the brothers, accompanied by the ever-faithful Baudoin (and the dog), set out from Philadelphia in late March, arriving at Mt. Vernon a few days later. Seeking advice on where they should travel to best see the new republic, Washington is said to have taken a map of the United States and sketched out a proposed itinerary in red ink, an itinerary that comprised a trip of more than 2,000 miles through Virginia, Kentucky, Tennessee and Ohio, to Pittsburg, then along the shore of Lake Erie to Buffalo, up to Niagara Falls, then across Western New York, south through Pennsylvania and back to Philadelphia. Following weeks of arduous frontier travel, poor food, bad taverns, worse roads, dense forests, swamps, mosquitoes, rain, and many chilly nights sleeping under the stars (it was at this time that d’Montpensier wrote to a family member, “We have spent fourteen nights in the woods, devoured by all kinds of insects, soaked to the bone, unable to get dry, eating pork and sometimes a little salt beef and corn bread.”), the brothers were suitably stunned by the sight of the mighty cataract of Niagara. Slogging east toward the Genesee River along the Indian trail that eventually became Route 20, they had their first of several unlikely meetings with some of the most prominent men in the area. Literally in the middle of nowhere, they crossed paths with Alexander Baring, scion of the prominent British banking house. Seeing the brothers’ travel-worn condition, Baring inquired if the trip to Niagara Falls had been worth the trouble. His answer was an emphatic yes! Traveling on, the brothers crossed the Genesee River by ferry near present-day Avon, spending the night at the home of Dr. Timothy Hosmer, founder of the village and owner of a wilderness spa utilizing the nearby mineral springs. By coincidence, Thomas Morris, prominent land speculator and son of Robert Morris, Revolutionary War financier and signer of both the Declaration of Independence and the Constitution, happened by on his way home to Canandaigua. Known by the local Indians as the “Fat Chief” due to his corpulence and love of good living, Morris was fluent in French and had even imported a French chef to the wilds of upstate. Morris invited the princess to be his guests for a few days, an invitation they no doubt accepted with alacrity after weeks of sleeping on the ground and eating backwoods tavern vittles and their own cooking. 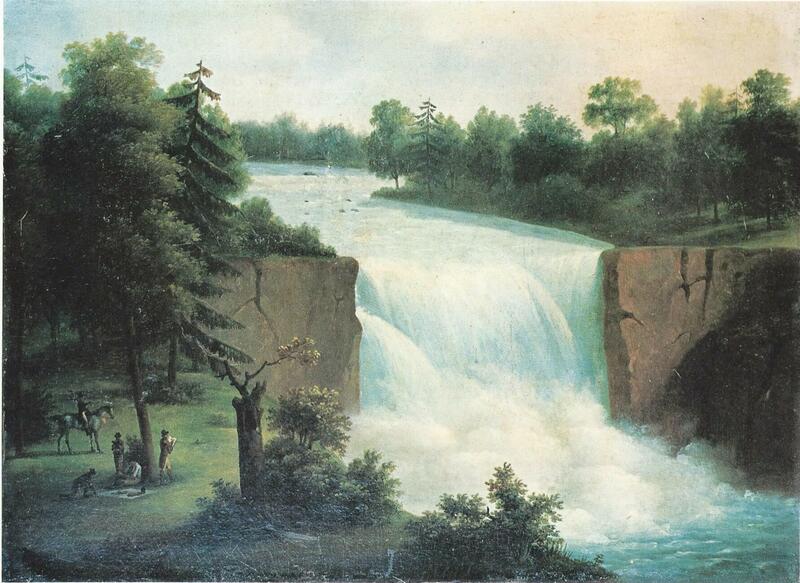 Perhaps in response to the brothers’ glowing descriptions of Niagara Falls, on July 12, 1797 Morris took them to see the three falls of the Genesee. While no doubt anticlimactic after the awesome power of Niagara, and despite being set in a swampy area with next-to-no settlers, and only tumbled-down grist and saw mills and a sagging cabin as signs of civilization, the sight was impressive enough for d’Beaujolais to sketch a scene of the three princess, Baudoin, and the dog, picnicking by what may be the High Falls, with Thomas Morris on horseback pointing out what would become the future city of Rochester. This sketch was subsequently turned into an oil painting (attributed to various artists but most likely executed by d’Beaujolais himself), and is one of the earliest depictions of the Falls of the Genesee. Many years later at an industrial exhibition in Paris, the by-then King Louis-Philippe happened upon an immense plate glass window being shipped to Rochester to be installed in the facade of a dry goods store. Reminded of the desolate wilderness he had seen in his youth, Louis-Philippe is said to have exclaimed, “What! Can it be that that mud hole is calling for anything of that sort?” (or words to that effect). Leaving the falls, Morris and the princes stayed at the tavern of Orringh Stone (today’s Stone-Tolland House in Brighton) where they feasted on roast pig, wild pigeon, turkey, cornbread, pies and undoubtedly some of Stone’s personal stock of applejack and whiskey. Returning to Canandaigua, the princess made the acquaintance of the “Baron of the Backwoods” Charles Williamson, the founder of many towns, and the greatest land developer and entrepreneur of the early days of Western New York settlement. He escorted them to his newly-built hotel in Geneva (now the Pulteney Apartments) where, tiring of traveling by horseback, the brothers disposed of their mounts and purchased a small boat. Via sail and oar, they made their way down Seneca Lake, walked to Newtown (Elmira), purchased another boat, and floated down the Chemung and Susquehanna Rivers, eventually arriving back in Philadelphia to end their American sojourn. In 1815, after many more years of exile (and following the early death of both of his brothers), the downfall of Napoleon and the restoration of the Bourbon monarchy enabled Louis-Philippe to return to France. Over the next few years he worked for a reconciliation with his royal cousins Louis XVIII and his successor Charles X, both of whom had found his liberal political views and early support of the Revolution anathema. Such reconciliation became unnecessary in 1830 when attempts by the government to take repressive measures against the rights of the people sparked the “July Revolution” and the ouster of Charles X. Known as “Le Roi Citoyen” (The Citizen King), Louis-Philippe’s rule was based on the support of the upper bourgeoisie. 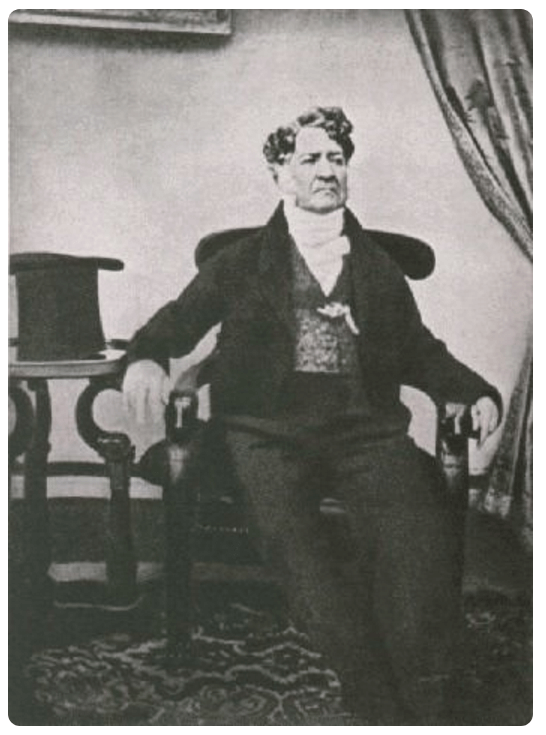 But a European-wide depression in 1846, and his failure to gain the support of the emerging industrial classes, meant that when the tide of revolution swept through Europe in 1848, he found himself being forced to abdicate and the French monarchy abolished. Oh, and as to that other king who might possibly have visited Rochester. He happened to be Jerome Bonaparte, younger brother of Napoleon. While visiting America in 1803, Jerome met and impetuously married Elizabeth Patterson. The couple, hearing of the glories of Niagara Falls, decided to journey there on their honeymoon (thus supposedly inaugurating a tradition for future honeymooners). Traveling by boat and stagecoach from New York City to Albany and Utica, the newlyweds traveled for nine days on horseback. Given the primitive and restricted road system in this area at that time, the probability is that they traveled the path of the future Route 20 straight to Niagara. But there exists the possibility that, like Louis-Philippe, they too took a side trip to see the Falls of the Genesee. Unfortunately for wedded bliss, big brother Napoleon had other plans for Jerome and ordered the marriage annulled, giving his brother the throne of Westphalia in Germany as a consolation prize. And that French emperor? Well, he’d be another Bonaparte. Louis-Napoleon Bonaparte, nephew of Napoleon. After being elected president of France in 1848, Louis-Napoleon staged a coup and reigned as Emperor Napoleon III until toppled from his imperial throne in 1870. But 33 years earlier, while little more than a vagabond bumming around the United States, he too had visited Niagara Falls. Little is recorded of his trip although we can again conjecture that he could have traveled via the future Route 20 and might have gone sightseeing to the by-then bustling canal city of Rochester, and now-industrialized the Falls of the Genesee. October, 26th, 1898: the Rough Rider on his way to the Governor’s mansion. TR Comes to Town, again…and again…and again… by Michael Nighan.